April’s edition of the Gazette of the 3rd London General Hospital covers the usual wide range of subjects, including noting that the magazine was now six months old and talking about its success. Some rivalry creeps in here, as it refers to one of their artists being sent there and “not to one of the other hospitals with whose magazines ours is in such pleasant rivalry”. The Gazette benefitted from a group of artists who had joined up as hospital orderlies – some of whom this blog has covered before, such as C RW Nevinson, but for this issue also included Australian artist Private Vernon Lorimer, who was a patient. The editors were pleased to have reached six months, as a voluntary endeavour often dried up after the first two or three, and felt that the Gazette “was never more alive than it is to-day” – although they did hope for the end of the Gazette when the war itself ended. There were several articles about the nursing staff, as there often were, this edition including a photograph of Queen Amelie of Portugal, who was one of the nurses. Although she mainly lived in France after Portugal became a republic, she came to the 3rd London General Hospital to help with the wounded, “performing the ordinary duties of a probationer, going to her ward on arrival, and leaving when her duties were finished”. Few photographs of her at work existed, as she preferred to focus on what she was doing and not the press – the photographs in the Gazette were presumably taken purely because it was the hospital’s own magazine. 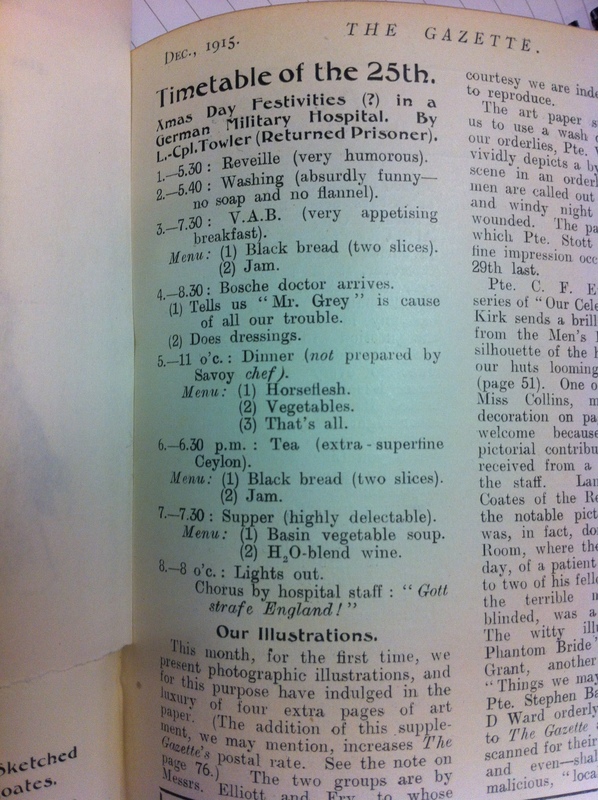 Nursing staff contributed their own articles to the magazine, including one about the first Zeppelin raid. It’s not clear if it refers to the first ever Zeppelin raid over London, or the first one which crossed over the hospital, but it does include an anecdote about a sister who sprang out of bed, dressed in perfect uniform at speed and disappeared to the wards, muttering: “let me die with my men”. The nurses and artists were also the subject of an illustration by Corporal Irving, showing one nurse in the style of the various artists. Left to right, those are: Stephen de la Bere; C R W Nevinson; Miss VAD Collins; patient Captain Tomkin McRoberts; “as she really looks to the average human eye”. 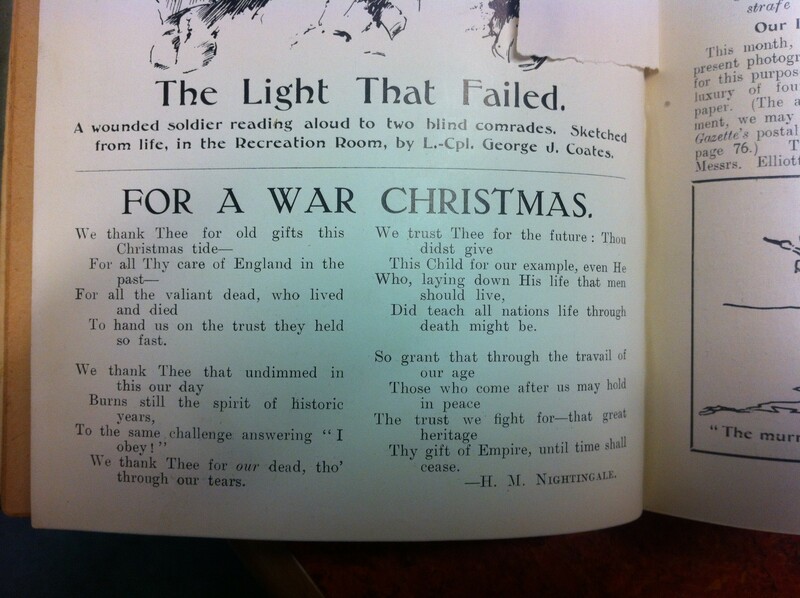 The December edition of the 3rd London General Hospital Gazette was produced with some Christmas cheer in mind, as it includes a poem “For a War Christmas” and a Timetable of the 25th. A full report of Christmas at the hospital does not appear until February, as both the December and January editions were sent to the printers before Christmas. …a cautious scribe is shy of effervescing over events which, at the moment of writing, have not yet taken place… It would have been sae enough to compose an “intelligent anticipation” in the past tense, asserting that Yuletide had been a stunning success – and the risk of fire, earthquake, or Zep bombs preventing the consummation of the prophecy was one which would have deterred no modern journalist from so congenial an exercise of smartness. It also has a write up from the Matron, describing Christmas at the hospital. On Christmas Eve, all the nurses went round all the wards with Chinese lanterns, singing Christmas carols. The Ladies’ Committee of the hospital had spent the weeks beforehand gathering presents to make Christmas stockings for all the men, which the nurses put on the ends of their beds for the morning and had what the Matron describes as “the greatest joy at Christmas… watching the men wake up and find them in the morning.” Buttonholes were given out on Christmas day by Matron and Mrs Bruce Porter, the Australian men got wattle (better known as acacia) in theirs. Dinner was served in each ward, with turkey, plum pudding and crackers. Queen Amelie of Portugal, who was a nurse, came in specially to have dinner with her patients – even getting a special cheer at the concert party which was given later. HRH Princess Louise, Duchess of Argyll, attended the afternoon tea part of the day with a special message from the King to the men – conveying his pride in them and wishes for a speedy recovery. Afternoon tea also included a cinema showing, as it had been recently gifted by a Mr Nichols, an American who was a friend of the Commanding Officer. It was all very different from the timetable of the 25th in a German Military Hospital which appeared in December’s Gazette, written up in sarcastic fashion by a returned Prisoner of War. The November edition of the 3rd London General Hospital Gazette includes an editorial on “Our New Orderlies”, a long-talked of experiment which had been introduced a few days before publication, and which had met with “a certain amount of criticism and even covert hostility”. This experiment was the introduction of female orderlies, previously considered a male job and one which some were obviously reluctant to see taken over by women. 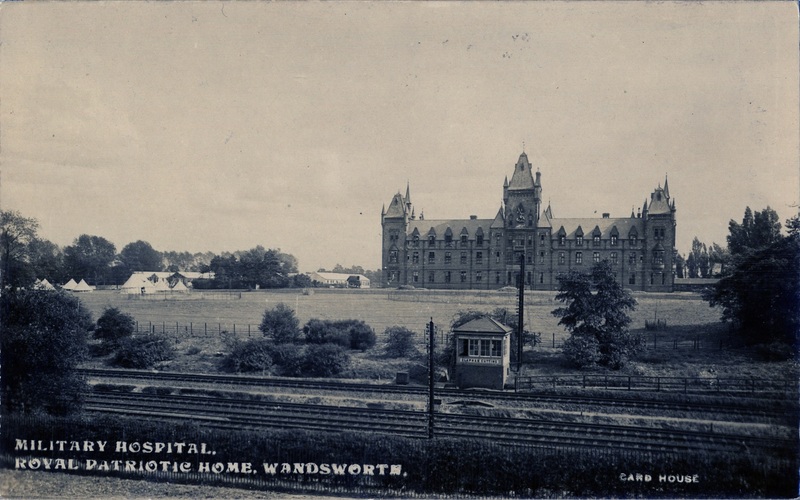 The Hospital had been one of the first to foresee an upcoming shortage of both RAMC men and trained nurses, so had encouraged the recruitment of VADs when other institutions were less keen. The article praises VADs for freeing up specialist nurses to go elsewhere, and now for doing the same for orderlies. Some of the men who were under 19 when they first enlisted had been freed up to join the hospital ships, which were apparently coveted posts. 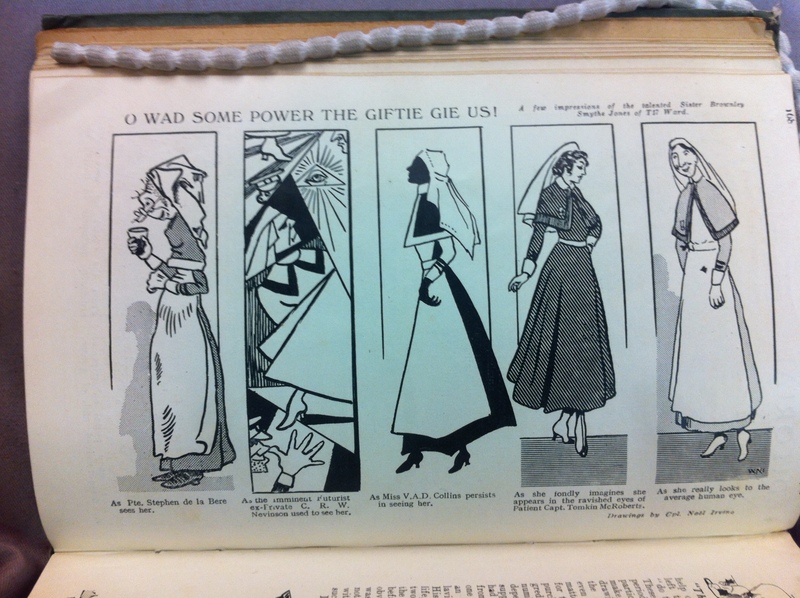 Some were referring to the new orderlies as “the orderlettes”, with a cartoon in a later edition of the Gazette showing “Orderlettes” and “Orderlims”, but overall the work was appreciated. The Gazette also contains hospital statistics, including from the kitchen and the linen stores. This was the main kitchen, there was also an officers’ ward kitchen, an infirmary kitchen, the nurses’ kitchen and kitchens for the orderlies and sergeants’ messes. The main kitchen cooked for the patients, for two diets – Special and Ordinary. Patients on an Ordinary Diet got meat such as roast beef, mutton, boiled beef and stewed steak. Special included roast and boiled chicken, fish, beef tea and chicken or mutton broths. In one day, the hospital got through 700lb of meat for ordinary diets, 100lb of fish, 100 chickens, 600lb of potatoes, 350lb of cabbage, 100lb carrots, 100lb turnips and 50lb of onions. On average, 50 gallons of milk were used each day. The Stewards’ Store issued still more food – 1000lb of bread passed through every day, as well as 100lb of oatmeal and 23lb of tea, and in a week they distributed 2 tons of potatoes and 400 siphons of soda water and lemonade. The article goes on to give details of the supplies that the laundry and other departments responsible for cleaning got through, and finishes with a check on the consumption of tobacco. In an average morning, 5500 cigarettes were given out and 92oz of pipe tobacco – the write wondered if this was enough to roll into “one fabulous fag [to] stretch from here to the trenches at the Front”, and hoped a reader might let him know. 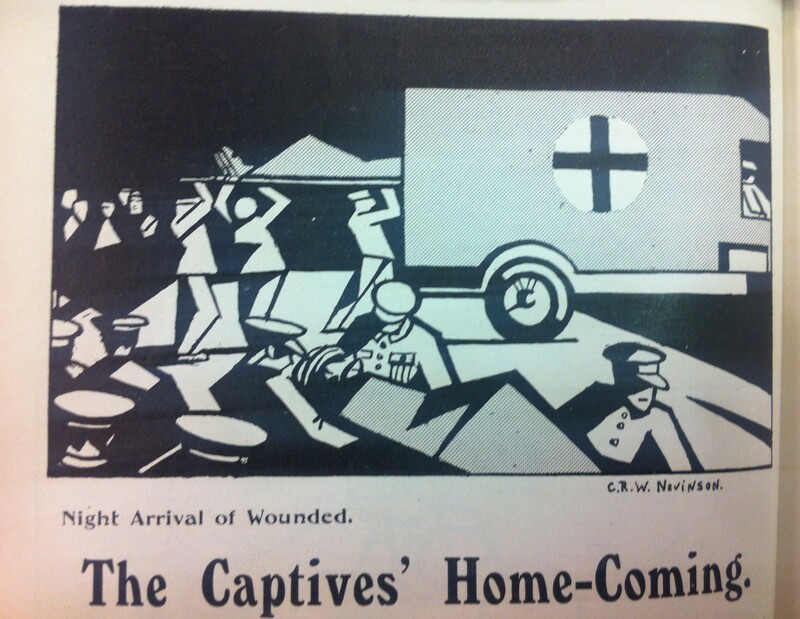 One of the illustrations, by C R W Nevinson, shows the Night Arrival of Wounded, and is above an article on the homecoming of Prisoners of War to the hospital on October 7th. Patients came in through Clapham Junction and were transferred over to the hospital by car or ambulance, and on this occasion each of the men arrived was given a rose and helped in to one of the waiting cars. The giver of the rose was a Mrs Dent, with her husband Lancelot she had started a volunteer transport between the station and the hospital – covered by another article in the same Gazette. Stretcher bearers included men who had to stay at home for various reasons, and would now leave work to come and help with the unloading. In a year, the volunteers had moved 45,715 men – 13,452 of them on stretchers. The first edition of the Gazette of the 3rd London General Hospital was published this month in 1915. 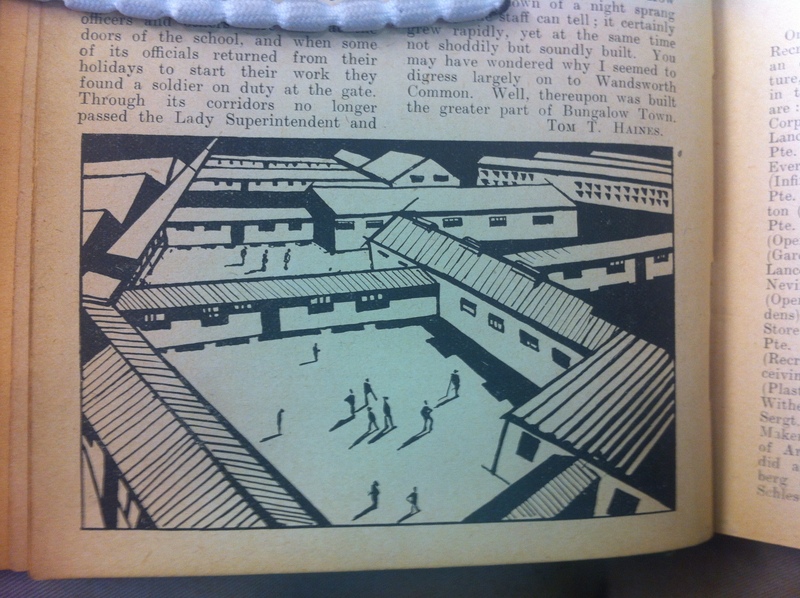 We’ve already used some of the articles in it on blog posts on the opening of the hospital and a royal visit. Contributions to the Gazette came from both staff and patients at the hospital. The editorial comments that they “little guessed, when we advertised for contributions, how prompt would be the response from the poets”. Not all submissions were considered suitable for publication – the second letter opened contained a series of poems dedicated to encouraging the “slacker” to enlist, which the editors decided was laudable “but here singularly unnecessary”. 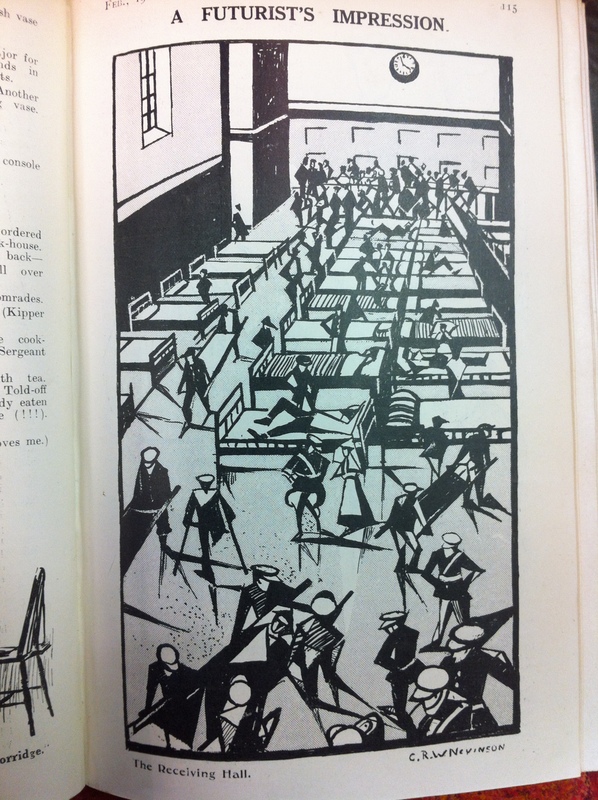 Illustrations were provided by several of members of the Chelsea Arts Club, including C R W Nevinson – who provided a Futurist view of the Hospital grounds – and Stephen Baghot de la Bere contributed a series of cartoons. These were described as having “characteristics already familiar to many of our readers through the public press”, although additional information about his career is slightly more difficult to find. Some of his paintings are in galleries around the country, see here for more information. 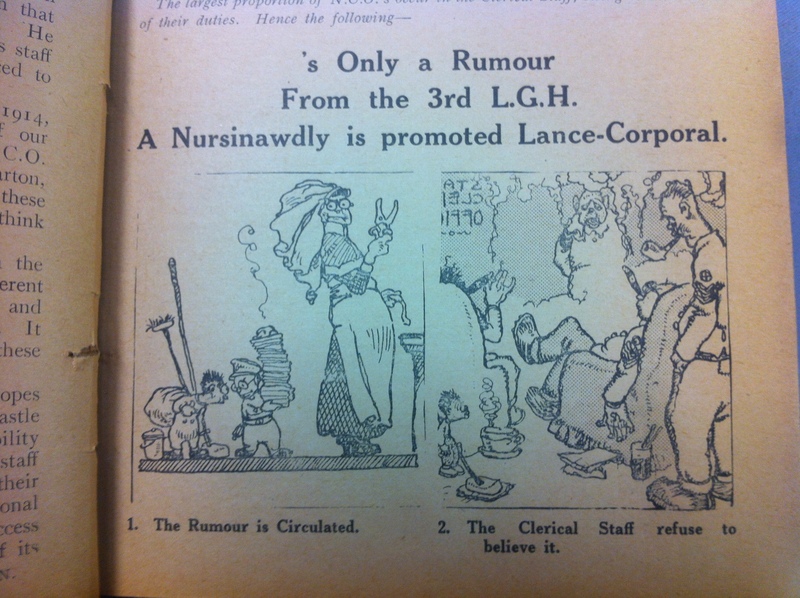 The cartoons covered the reactions across the hospital to the rumour that a lowly nursing orderly might be promoted. According to the CO in a later Gazette, the majority of the orderlies to begin with were young men recruited from Messrs Hitchcock and Williams (which seems to have been a drapers). After the hospital was set up, orderlies were given the chance to transfer abroad if they were deemed fit enough, so that by the time the Gazette was produced all of the orderlies were either over 38 or under 19. At least two artists were orderlies, as mentioned above, but they were joined by an ARA, an ARSA and members of the International Society of Painters, Sculptors and Engravers, the Royal Institute of Oil Painters and the Société Nationale des Beaux Arts. There were also teachers, actors, a retired professional boxer, a piano tuner, a “character vocalist”, dentists, a stage carpenter and a cinema pianist, amongst others. The Gazette gives some statistics on how the hospital was staffed, as well as details on where the staff came from. There were 42 officers and 204 NCOs and men and 114 Territorial Force sisters and nurses. VADs were called Probationers, there were 134 of them. A hospital extension was due to be completed, meaning that figures would only go up, but staff also included Engineer’s staff, laundry staff, tailoresses, officers’ and nurses’ servants – plus 25 Lady helpers from the Red Cross Society and Labour Exchange. The Gazette is available in the Heritage Service. 27 July – 2 August 1915: Patriotism and Can They Believe It’s Not Butter? The meeting of Wandsworth Borough Council on 28th July was a largely uncontroversial affair, with the reports in the Wandsworth Borough News mainly covering Council decisions without any debate. Economy was driving many of the decisions made by the Council, as well as patriotism, with a decision to dispense with all members of temporary staff who were eligible to serve with the Armed Forces. An appeal by the Central Charities Committee of the Social Welfare Association for London to consider filling temporary posts with Belgian employees was met with a decision to do so only when the Belgians were not eligible to serve with the Belgian Army. The decisions were partly fuelled by the need to save money but presumably also the enthusiasm for the local battalion, the newspaper reported that after 4 weeks nearly 900 men were wearing the uniform of the new battalion and it was expected to reach full strength in the next few days. Young’s had placed the Ram Brewery yard at the disposal of the regiment as a parade ground and Council support for the battalion included free use of the baths, as well as offices and support for the recruiting staff. A recruiting rally at King’s Hall, Tooting had produced 30 new recruits, all of whom were given a half-sovereign by the proprietor as a “reward for valour”. Intelligent young men wanted age 17 and under 19 to serve for duration of War at a Military Hospital as Hospital Orderlies. Home Service. Pay 8s 2d per week, all found. Address: Sergt Major, Borough News, Wandsworth. Finally, the paper did have one controversy to report on – the decision of the Wandsworth Board of Guardians to stop using butter and start using margarine instead. This a “war measure”, prompted by economy, but led to much argument over the merits of both substances. Miss Hill had been very against margarine, but had recently tried “Maypole” and claimed her family did not know the difference, whilst Mr W H Smith said that margarine was often supplied instead of butter in the best restaurants and he saw no objections to it. Other board members argued about the nutritional value, and if all officials should have the same restriction or merely the inmates and patients. Mr Couzens refuted the argument that some prefer margarine by stating he had tasted it last Tuesday and should certainly not prefer it to butter. Eventually the arguments for either, and the claims not to know the difference, resulted in the decision to use margarine.